There are several parts of the Milky Way where no dust blocks our view, the Scutum Star Cloud is one of those. 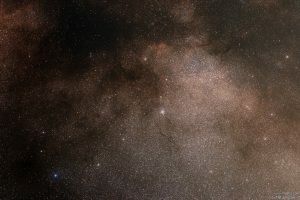 E. Barnard called this region the “Gem of the Milky Way”. The large galactic star cluster at the center of the image is M11, the Wild Duck Cluster. It is situated at the northern edge of the star cloud.